Are you a member of a growing Grange, a stagnant Grange or a dying Grange? This is a very personal question and requires a thoughtful response. You may believe you have no power or responsibility to sway your Grange’s reply. But you do. In fact, only YOU do. A Grange cannot grow by itself; it takes individual initiative to grow your Grange. It takes YOUR personal active solicitation to bring a new member into your Grange. It’s kind of like that old standard we’ve all heard during a membership drive at one time or another. When the Master asked if there were any applications for membership to be presented at the meeting, there were none. While anybody could have brought a signed application; and somebody surely should have; in the end, nobody did, and that Grange perished from the earth. In my travels, I witness wondrous rebirths of previously-dying Granges. I have seen new Granges grow and strengthen communities. And I see Granges stuck in the “same-ole, same-ole” routine with never-changing officers and little activity outside of the Grange Hall. Here are some figures to be proud of in Connecticut Granges. 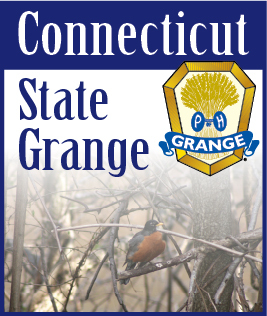 Last year, thirteen Subordinate Granges in Connecticut had net gains in membership. That is positive growth. That represents new energy in our Order. Consistently working toward net gains in membership will perpetuate The Order of Patrons of Husbandry. (Number of members gained in parentheses): Taghhannuck #100 (1); Stonington #168 (1); Simsbury #197 (1); Southington #25 (2); Killingly #112 (2); Bethlehem #121 (2); Cannon #152 (4); Greenfield Hil #133 (6); Beacon Valley #103 (8); Hemlock #182 (14); Norfield #146 (19); Wolcott #173 (22); Harmony #92 (24). Individual Patrons within these Granges asked someone to join their Grange and they did. Several other Granges took in new members, but perhaps not quite enough to realize a net gain for the year. Do not despair; in the lesson of the Fifth Degree, Hope on, Persevere ever. In a small minority of Granges, new members join, but they leave us soon after joining. Perhaps something in their life precluded their regular involvement. How many of you are caring for older family members and perhaps helping raise the younger generation simultaneously? We cannot combat changes such as this. However, how many new members do not benefit from the Grange because they feel unaccepted or unwelcome? How many may leave because one person, or a small group, openly criticize or use the Grange meeting as their personal “stump” to air their grievances with local or federal governance or some personal cause. I have been consulted as to how to handle these types of situations. Would you return to a restaurant where you were treated rudely? No, neither would I. Would you frequent a business where the office assistant is overbearing and demeaning? Nope. Same goes for a Grange. I might go to another Grange, or I might give up on Grange. You and I are the “face” of the Grange. How we interact with others is how they will perceive our Grange to be. We must be the one to greet a guest or new member. Do not leave it to the new member to introduce him or herself to you. Invite them to your table for refreshments. Explain the opening ceremony of a Grange meeting to them. Answer their questions willingly. What may seem so obvious to you and me is likely a mystery to visitors. Be gracious. Brothers and Sisters, in our Order everyone gets to have their turn on the “stump”. Everyone gets to say their piece. But, no one should be allowed to dominate the discussion or shut down another’s perspective. In my forty years as a Patron, I have witnessed, first-hand, two phenomena in our wonderful organization. First, we are a kind people. We do not want to hurt another’s feelings. As a result, we “put up” with a lot more unkind or domineering behavior in a meeting than we ought. For those of us who have been members alongside one or more of these cantankerous members, we have become immured to their behavior and say, “Oh, that’s just his way; he doesn’t mean anything by it.” But to a new member, this member’s actions and words may chase them away from a long-term, meaningful relationship as a Brother or Sister of the Oder. When you or I sit by and watch this occur, we are each responsible for chasing away the new members. When I’m asked to suggest a solution to this dilemma I look two places, in my heart and in the Grange Digest of Laws. If the ornery member is trying to control the action of a Grange, the Digest should be invoked to quell these intentions. If the member simply feels compelled to speak repeatedly and at length on issues, parliamentary procedure can be strengthened and enforced equally among all members of the Grange. Will the offending member react softly to encouragement to change his or her demeanor? That is the key question. Possible outcomes include, the members gets angry and storms out of the meeting…never to return…to return at the next meeting and act as ever before…or to return a bit more mellow and understanding of others. Or, the member may demit to another Grange. This may or may not solve the problem; it may simply displace it to the receiving Grange. Or, the member may quit, never again returning to Grange. In my heart, it is sad when someone leaves because of the actions of another. It is sad when a long-time member cannot change his or her ways and is asked to leave so as to not dissuade others from remaining. It feels like a no-win situation. And, it really may be a no-win dilemma on the individual, personal level. But what about at the organizational level? Are we to squander the future of our Grange because of the short-sightedness of a few members? The hardest thing for some Grangers is change. Changing the ritual to be more modern. Changing the language from the flowery text of our Founders to more common words of contemporary society. I am caught in the midst of this whirlwind also. I grew up in the New England Grange, the staunch supporter of ritual and ceremony. I love it. It’s hard for me see why other parts of the country, or newer members don’t cling to it as I do. But, for our Order to grow, and we are so close to growth at the highest level, we need to appeal to today’s Grange member. Last year, 461 Granges across the nation had net gains in membership! Nine state Granges had net gains in membership! Connecticut is so close to having a net gain, too! I know if you work together to invite new members; to include them in your activities; and make them feel welcome the next year will be a bright one for all. Another saying I learned in Grange as a young man is that, “If it’s to be it’s up to me.” I invite you adopt that philosophy in your Grange.